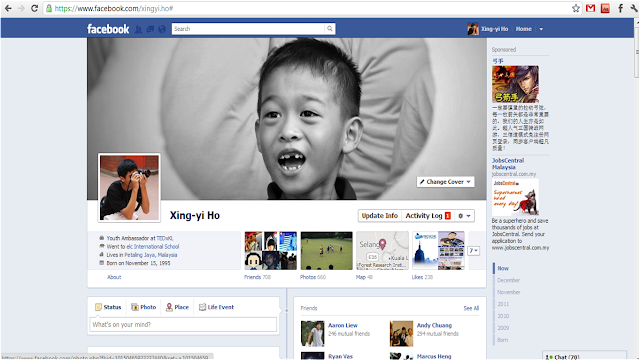 Well, well, well, after about 2 months since Mark Zuckerberg's first announcement, and after facing a lawsuit against timeline.com, Facebook has finally revamped its design on our profiles - which will be now known as timelines. And as what it is called, Facebook will break down your profile in terms of months and years (up till your date of birth but that section will really has nothing much unless you had a Facebook account since birth!). So basically, you can now easily track your own profile, as well as (stalking) others for each year. Let's say, I can go to 2009 and see what I did and what happened during the year. Who I 'friended'? Where did I go? My statuses? Check. So is this, yet another change on Facebook, for the better or for the worse? First off, I do believe that the design is improved, especially the 'cover' photo on your profile which enhances the 'first impression'. However, on the timeline, which tracks past events easily, may or may not be better. I don't know, what do you think? Note: You can get your timeline here.